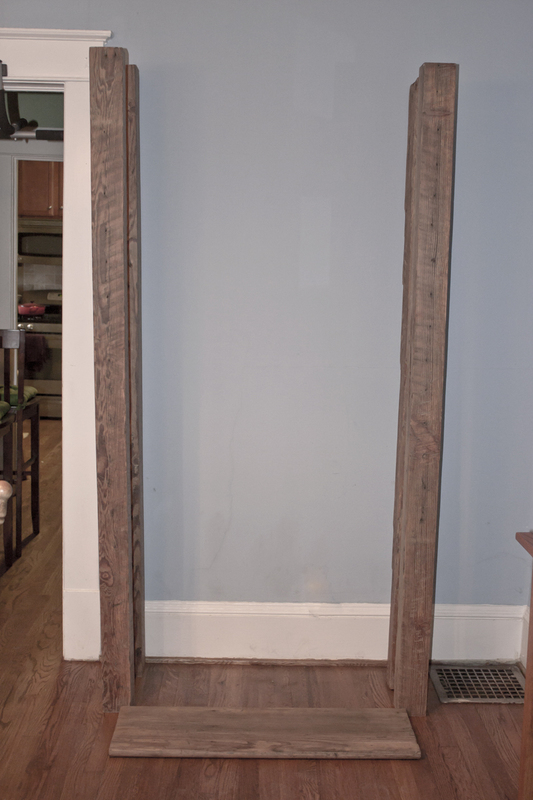 Today I made the first steps towards assembling the heart pine shelf for our dining room. The basic design of the shelf includes four 7 ft heart pine 4x4s for legs and old heart pine stairs as shelves. 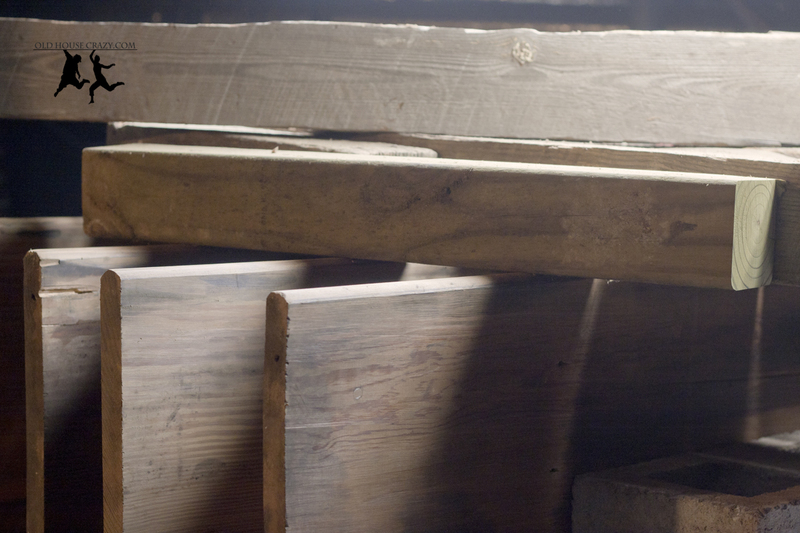 The 4x4s came from my Uncle Bob’s farm and the stairs came from the old staircase that led into our crawl space. The picture below shows the beams and one of the stairs to give you a general idea of where I’m heading. The reason for this post, and its strange title that makes me think of breakfast, is that the stairs only measure 11.5 inches deep. We plan to store serving ware and our more visually pleasing cookware on these shelves, so we need them to be deeper than that. This is where biscuit joinery comes in. See, I could have just gotten some bigger plywood at Lowe’s, but that wouldn’t be in the spirit of this blog or the design of our home. Instead, I decided to connect slices of broken stairs to the intact ones to make shelves that are 15 inches deep. I could do this quite simply by nailing or screwing each piece to a brace of some kind, but that looks, well, like two boards nailed to a brace. While reading to prepare to build our farmhouse table, I learned of a woodworking technique called biscuit joinery. This picture above shows #10 biscuits. They’re kiln-dried, compressed nuggets of birch wood. 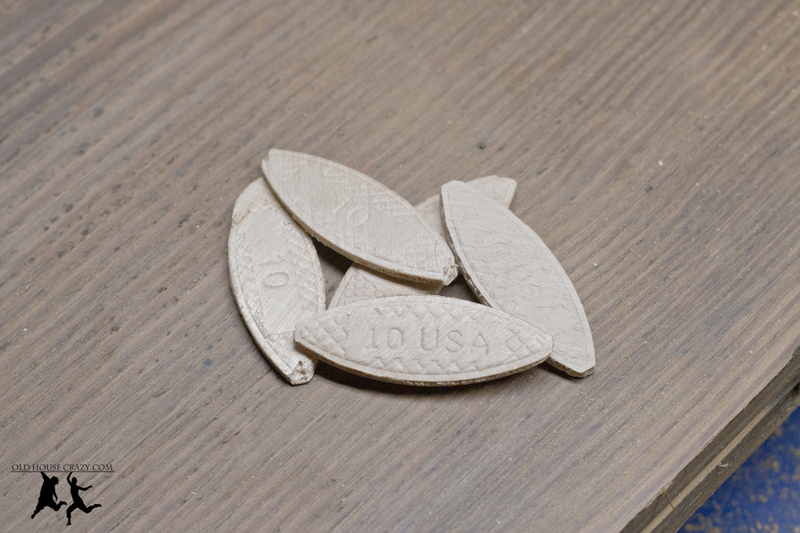 The basic idea is that you cut a groove into each of the pieces you wish to join together, squirt some glue into the grooves, toss in some biscuits, and clamp the pieces together. Since the biscuits are kiln-dried, they have next to zero water in them. 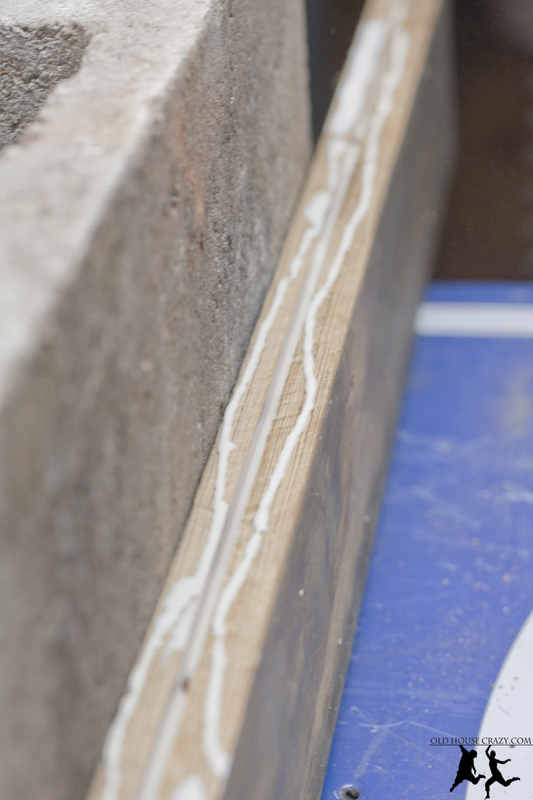 The water in the glue causes the biscuits to expand and press upwards and downwards into the groove, creating bonding forces much stronger than those of the glue alone. It’s a pretty neat idea. Here you see the basic setup. 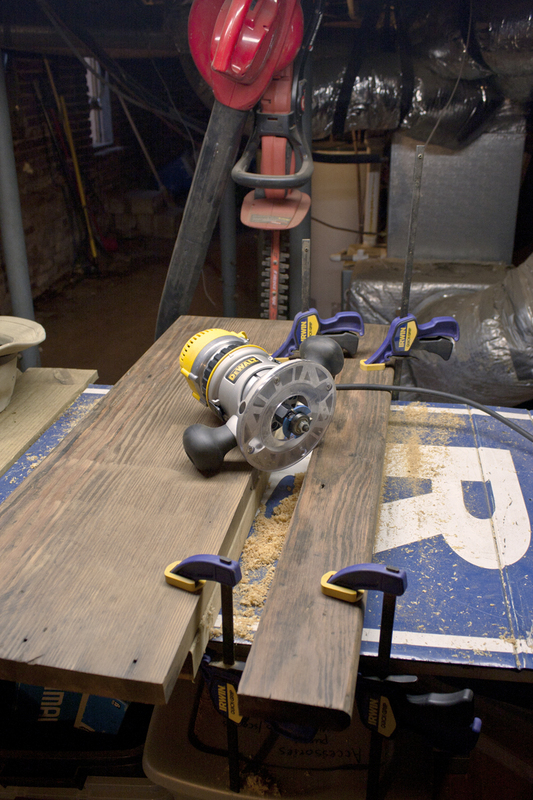 The two pieces are securely clamped to the bench (this is very important for safety reasons when using a router). The next photo shows the router bit used to cut the groove, or slot, in the two work pieces. I got mine from Rockler, and have been very pleased with it so far. It cuts through the heart pine like a knife through warm butter. The other option is to buy a biscuit joiner, which is a whole other power tool. Depending on how many biscuits you plan on consuming (ba dum), you might consider purchasing the dedicated tool. For limited use, I think the router bit will do just fine. The next two photos show the bit in between the two work pieces. I adjusted the bit to a height so that it was more or less in the middle of the wood. With this joining method, you don’t have to be exact, because if you’re off, you’re off by the same amount in each piece. The two grooves will always line up. I’ve supported the work pieces with scrap lumber to lift them off the bench. Otherwise, the bit would hit the work surface. 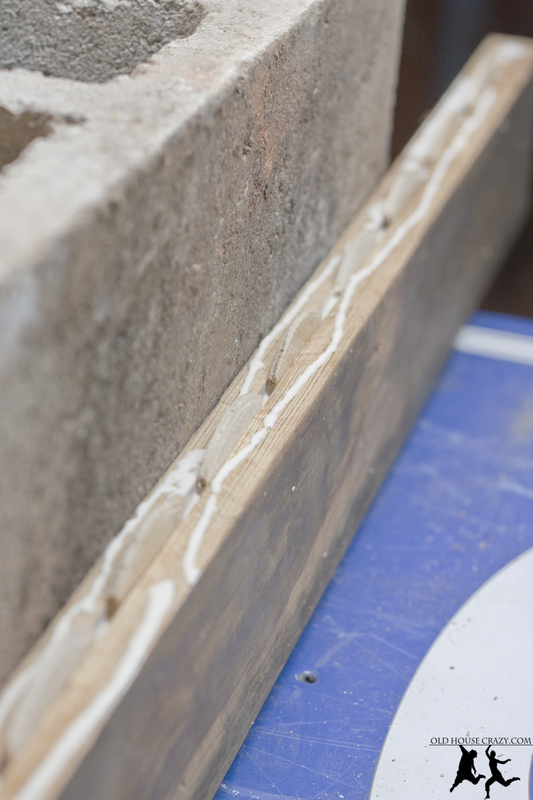 In the second photo above, you can see the grooves that were cut in each work piece by the bit. 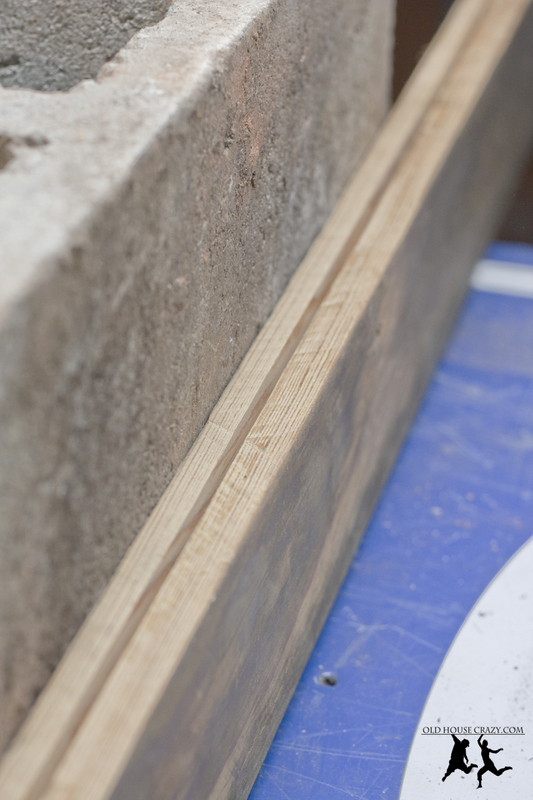 Since each piece is helping to support the router while you cut the other, the height of the cut will be exact for each piece. Side note: The blue part of the bit is the cutter. It is carbide tipped and extremely effective at ripping into wood. 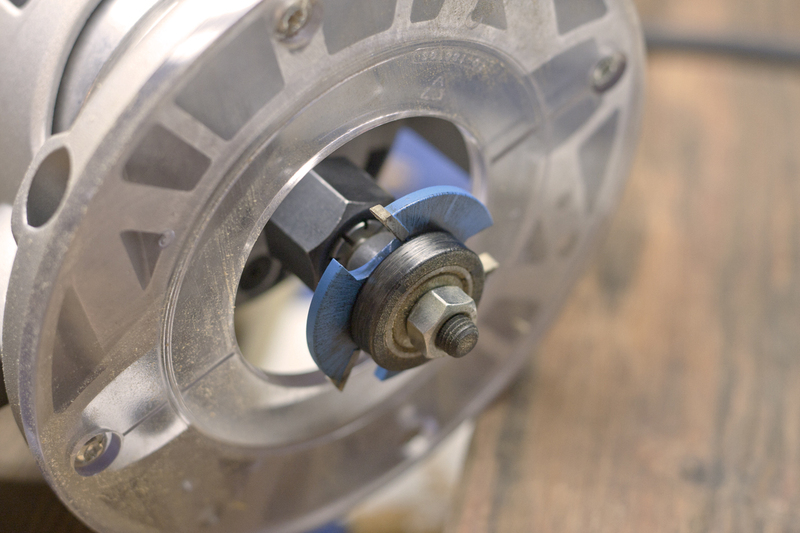 The graphite grey colored circle below the blue part is a bearing that doesn’t contain any cutting surfaces. 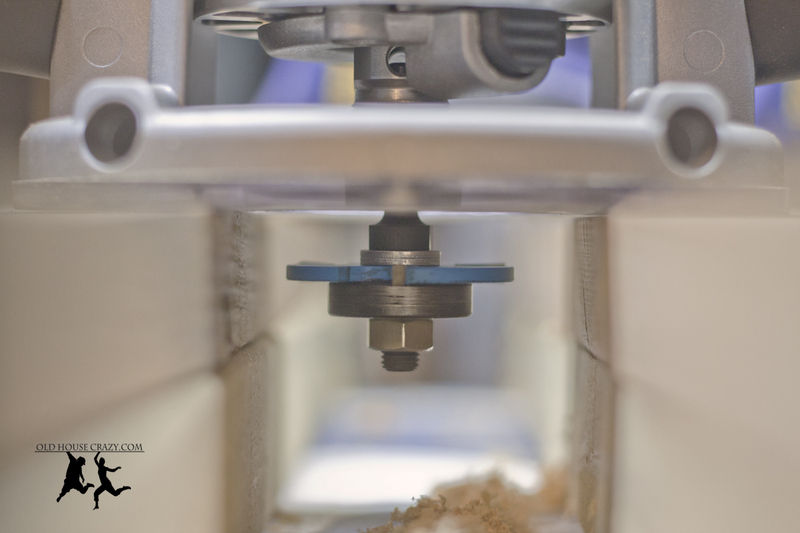 When the bearing strikes the surface of the wood, it stops the bit from cutting any deeper. 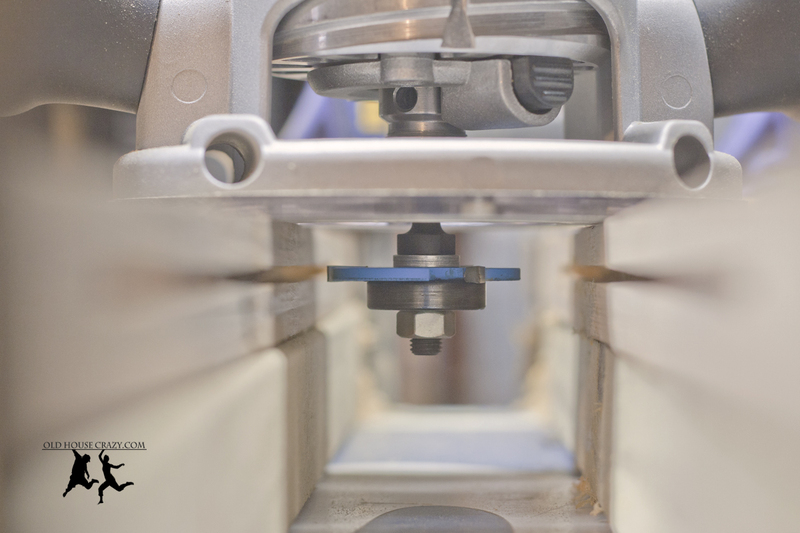 By changing the bearing, you can change the depth of the cut and, in turn, use different sizes of biscuits. Super fancy. The series of photos below shows what I did after the grooves were cut into each of the 8 work pieces (glued together, they make four 15″ deep shelves). 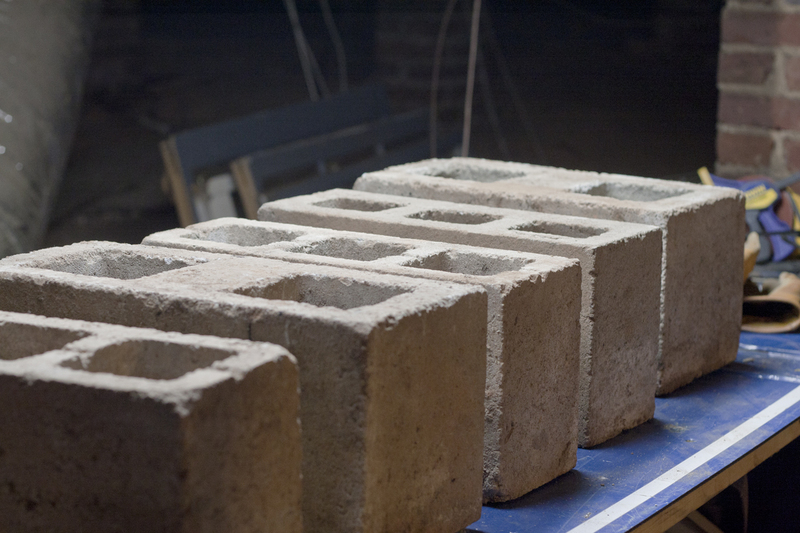 I set up cinder blocks to support the boards and allow me to add weight in lieu of clamps. It’s much more effective and professional to use clamps. They’re also expensive. I mean, it’s not bad to go buy one clamp, but I’d need at least 8 for this job. The smaller piece went on the bottom, as the larger piece has more mass and adds more pressure to the joint by being on top. I squirted glue into the groove, as well as on the other surfaces. Then, in went the biscuits. I spaced them about 3/4″ apart. Once the biscuits were in, I squirted glue into the groove on the other piece and fit the two pieces together. 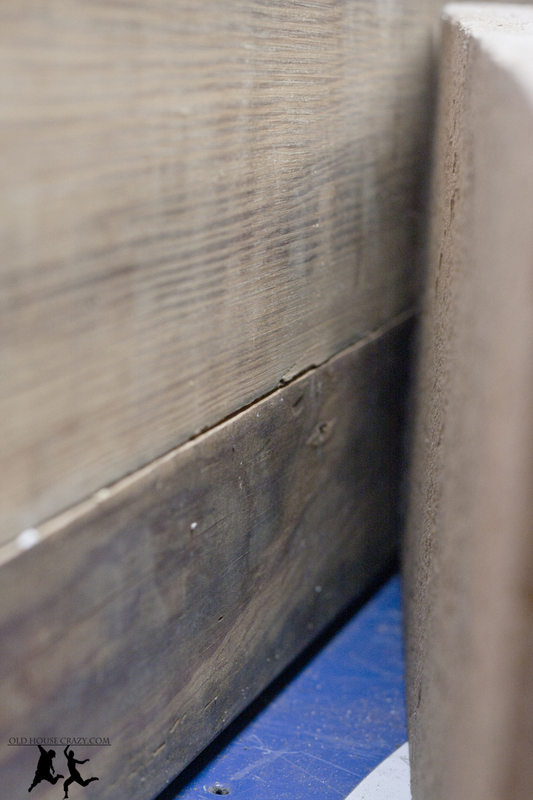 After all four shelves were attached, I stacked lots of heavy lumber on top to apply downward force to the joint. Once again, clamps would have been nice, but I don’t have them. Thanks for reading. More to come soon. This entry was posted in DIY, Furniture, Heart Pine, Home Built, Tools and Techniques and tagged biscuit joinery, router bit, using a router, woodworking technique. Bookmark the permalink. I have just started working with wood. This site is pretty cool.